The operation of a smartphone has not changed since the first days of this device class. You have to tap a display with your finger or a stylus to do something. That’s what Samsung wants to change. One knows countersteering already from other areas and exactly this would like to take Samsung for coming Galaxy smartphones. The goal should be to be able to perform certain commands completely without touching the smartphone. In the now emerging patent already first gestures are described, which can be done without touching the smartphone. You do not have to activate the gesture control before. Instead, a sensor should know when to make a gesture and start a special mode. In this mode you can scroll up or down, swipe left or right, run a tap by the distance to the screen. 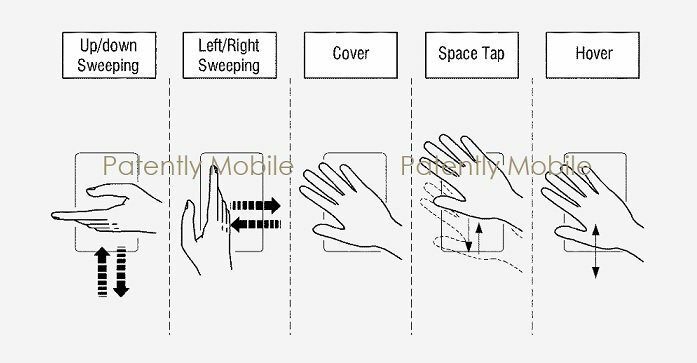 Gesture control for future Samsung smartphones. ( Source : Patently Apple ). Gesture control is not a new area for Samsung. The Galaxy Note series, in combination with the stylus, can already perform certain gestures without touching the screen. A complete operation without contact is not possible. It is unclear when exactly the new technology will be used. Samsung not only has to install an additional sensor, but also to adapt the software. Smartphone operation with gestures: what’s in it? There are quite a few scenarios in which a gesture control would be very useful. Basically, whenever you can not or can not touch your smartphone. For example, with dirty hands, when driving a car and the like. So you could reach certain functions anyway, without having to concentrate too much on the small buttons of the display. Some vehicle manufacturers are already incorporating gesture control in their cars to operate the entertainment system. Changing a song or reducing the volume works with a fugitive gesture much faster and safer, than fumbling on the screen. Where could you imagine such a service?